"How do we know which side that bird is on? Why shouldn't it be leading us into a trap?" "That's a nasty idea. Still—a robin, you know. They're good birds in all the stories I've ever read. I'm sure a robin wouldn't be on the wrong side." A whole race or culture of fair and benevolent beings. Obviously, inverted Always Chaotic Evil. Sadly enough, not Truth in Television, but that's why these races exist: to show humans that they need to improve themselves. This alignment is often justified by the race being somehow "close to Light". This trope is certainly very idealistic and is used mostly in shows with Black and White Morality. The more cynical shows love to subvert it by revealing they are not as good as they appeared. It is said that God Himself is always good and righteous even if He seems unpleasant to others. Angels, if they are not too different. "Angels in the house", perhaps better known as Proper Ladies. Mother Nature, usually even during moments of Gaia's Vengeance. Elves if they are close to Tolkien's original conception. His original idea behind them was to depict a people not corrupted by the Original Sin. The exceptions are settings which say Screw You, Elves!, have elves being another name for The Fair Folk, or feature Dark Elves instead or along with the Lawful ones. The Paladin and his Order, if they exist, will almost always be some variant of Good, with an emphasis on Lawful. Both this trope and Always Chaotic Evil are less frequently used, especially with classical versions of this trope such as angels, elves, and fairies all increasingly portrayed as at best just as fallible as humanity. In extreme cases one or the other can disappear, depending whether the setting says Silly Rabbit, Idealism Is for Kids! or Silly Rabbit, Cynicism Is for Losers!. Either that, or both start to move towards the middle of the moral scale, as the setting becomes grayer in general. Often a whole race of The Beautiful Elite or an Inhumanly Beautiful Race, since Beauty Equals Goodness. Compare Noble Profession. May be employed with Alike and Antithetical Adversaries. This is a Planet of Hats where the "hat" is being good. For this trope applied to humanity, see Humans Are Good. Note that before adding examples to this list, just like its evil counterpart, Lawful Good is only the Trope Namer. Also, like Always Chaotic Evil, Always Lawful Good also does not necessarily mean that everybody of the race is of the same good alignment. While a race can literally be Always Lawful Good and apply for this trope, this also extends to races that are also Always Neutral Good and Always Chaotic Good, or races that have Lawful Good, Neutral Good and Chaotic Good individuals, but no evil individuals of any kind. Wedding Peach have the angels fill this role. 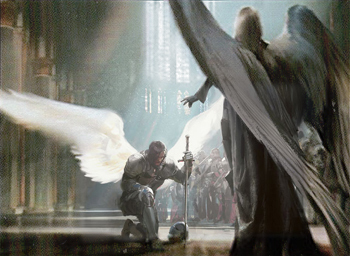 Even the worst of them is a Knight Templar who thinks the angels aren't doing enough to help the humans. Averted in the OVA, where angels can fall and become demonic. The Universe 6 Saiyans of Dragon Ball Super, while still being Blood Knights, use their powers to protect defenseless planets instead of pillaging them. Jewelpet Twinkle: The Jewelpets themselves are this, due to Jewelina creating them out of the good qualities of humanity; their lot in life is to help people. Even the one Jewelpet created by the Big Bad instead of Jewelina, Diana, ultimately leans on the side of good. This is averted in the other anime seasons, which are all their own continuity. The Jewelpets run the whole gamut of Character Alignments in them. The Trell from Big Finish Doctor Who are implied to be this, with the Doctor saying they are a law-abiding species. A Police Marshal serves as a Reasonable Authority Figure and though some are mooks for the villain they are mind-controlled. Dakari-King Mykan, the author of My Brave Pony: Starfleet Magic, claims that the Unicornicopians are this. Their actions, particularly their treatment of Ace Ray, prove otherwise. In Ashes of the Past, Riolu and Lucario have a sense of justice apparently written into their very DNA; Aaron's Lucario realizes that Ash is telling the truth when he sees his Riolu defending him, something that wouldn't happen if Ash was a bad person. This is later exploited: during the Mirage Pokémon event, Dexter manages to access the system and manifest a Riolu briefly, which gives the Mirage Pokémon a conscience. Which is why it's such an Oh, Crap! moment when Ash and Co. encounter a Shadow Lucario created by Team Galactic. The Mystics in The Dark Crystal. Justified in that they're the innocent, non-violent spiritual half of a species that became divided into two races, the other being the Always Chaotic Evil Skeksis. Redwall: Mice, otters, hedgehogs, moles, hares, badgers, and squirrels are always good, and probably living in Redwall itself. Shrews are generally Chaotic Good (but always chaotic); voles are good but sometimes whiny (though there was one vole in Martin the Warrior who was a traitor and a spy). The eledhel (elves of light) in The Riftwar Cycle live in a perfect Hidden Elf Village Utopia with no internal strife. All named eledhel to date have been unfailingly wise, noble and heroic. Notable because in this world, they are the same race as the dark elves (moredhel), who are war-like and hostile, differing only in their mentality and lifestyle. Though it is possible for a moredhel to embrace the eledhel way of thinking and thus Return and become eledhel, the reverse does not happen. Ever. Making this a case of Incorruptible Pure Pureness. This is deconstructed with the Andalites. At first, all we know about them is that they're fighting the Yeerks, so the Animorphs assume that all of them are good - Jake even describes them as "the good guys of the galaxy" in an early book, and the resident Andalite is barely a teenager like them, so he doesn't know any better. Starting in The Hork-Bajir Chronicles, we see that the Andalites can be just as bad as the Yeerks (who were a deconstruction of Always Chaotic Evil), just in different ways (traitors, cowards, and genociders are among those we meet). Ax himself nearly gets himself outcast from his own society at the end when he stands by his allies rather than the Andalite soldiers (and then it turns out the Andalite military is not Andalite society, and there's an open channel to the rest of the Andalite population who are watching their military go all Knight Templar). Tobias once morphed Ax and discovers they're not naturally "good" so much as have a sense of permanent optimism. Ax never comments on this even in the books where he's narrating, but then he's too distracted by his new senses when in human morph. Played straight with the Pemalites, a highly developed and joyful race that praised life and abhorred violence, so much that when the Always Chaotic Evil Howlers arrived, Pemalites failed to muster any defence and were exterminated. But when Jake gets a Howler morph, he's horrified to discover they aren't Always Chaotic Evil murderers, but children who think they're playing a game with other species. The Houyhnhnms of Gulliver's Travels. They are incredibly honorable, intelligent horses that live alongside feral, deformed humans (called "Yahoos") that appear to be Always Chaotic Evil, though this is later revealed to be a prejudice on the Houyhnhnms' part. Adventure Hunters: War Golems are a race of Martial Pacifists. Every single one of them abhors violence. If you leave them alone, they will leave you alone. If you attack them, they will wreck you. This is because their personalities are copies of their creator, who was himself a pacifist. The Stormlight Archive: Sylphrena and other honorspren are literally made out of Lawful Good-ness but sometimes she can't give Kaladin a good answer to his moral dilemmas. In particular, she has problems with dealing with the parshmen, who have been mindless slaves for centuries. Since honorspren are shaped by the human idea of honor, humanity's Fantastic Racism has seeped into them a bit. Kaladin: You're a... what, embodiment of human perceptions of honor? Shouldn't you at least think you have all the answers? Syl: Probably. Or maybe if there are answers, I should be the one who wants to find them. The Organians, and possibly the Metrons, on the original Star Trek. For that matter, most of Star Fleet itself is portrayed as something like this (with a few bad seeds), until the existence of Section 31 was revealed (after Gene Roddenberry's death, of course), and even they were Well Intentioned Extremists with Unscrupulous Hero tendencies rather than outright villains. The Nox always qualify. In one episode, they were called in to mediate a trial because everyone knows they'll be fair in their judgement. The Asgard usually do since they're fighting the evil aliens and are mistaken for heroic deities like Thor. The Ancients occasionally do (when they're not Always Lawful Stupid), depending on which episode in which series you're watching. Babylon 5: Vorlons are a subversion as they turn out to be just as petty and terrorizing as their opposing species, the Shadows. As a whole they turn out to be merely Always Lawful, ranging from the Lawful Evil Ulkesh to the Lawful Good Kosh, with an emphasis on Good over strictly Lawful (he had no qualms about encouraging The Chosen One to bend the rules when necessary to maintain long-term order). The Eternals were originally intended to be this, although not much is revealed about them in the show and the Expanded Universe depicts them as having their fair share of villains. Considering they exist outside time, they could be Above Good and Evil. Some species, such as Star Whales and Thals, have also only been shown in a positive light, though only one Star Whale has been seen. In their first appearance the Thals claimed to have once been a race of warriors, but after war wrecked their planet they became peaceful. Also their pacifism goes to the extent that they are willing to die rather then fight the Daleks and the TARDIS team have to convince them otherwise. Metallic dragons in the first several editions had to be lawful good. non-metalic dragons were the evil kind. They're also a Trope Codifier. Paladins are a literal example because a paladin who is not lawful good ceases to be a paladin. This changes in the fourth edition, where they were allowed to be any alignment so long as it matched their patron god. The supplement Remarkable Races introduces the kval and magogol, both of which are biologically forced to be Good. Though Eberron mixed up most of the usual alignment codings (e.g. metallic dragons aren't necessarily good there, or even more likely to be good), it added the kalashtar PC race, who *are* mostly lawful good, and unusually added a justification: kalashtar exist from birth in psionic symbiosis with one of 66 good quori (who are kind of smeared around the larger population). You're partly human with the usual genetic randomness, part a specific immortal good creature. Planescape helped codify the Archons, the native denizens of Mount Celestia who are Made of Lawful Good. There are also the Always Neutral Good Guardinals of Bytopia, and the Always Chaotic Good Eladrin of Arborea. As well as the Always Neutral counterparts, and the various Evil fiends. Planescape is big on thematic symmetries. World of Warcraft ultimately subverts this trope. If any race appears to be this in the game, chances are there are at least some corrupt members of that race. The naaru are basically angels but not so much when they "lose their light" and become Void Gods. There are also Draenei members of the Twilight's Hammer. In addition, many of the Draenei on the alternate Draenor are (openly or secretly) members of the Sargerei, an entire faction of corrupt Draenei. It should also be noted that draenei are not a race; they are a faction (and a fairly small one at that) of the eredar, a race that is otherwise very, very evil. Presumably, any draenei who do not want to be goody two-shoes find their way into the Burning Legion, where the majority of their people are (which is what happens in Warlords). The Pandaren are the only race so far that seem to lack villainous members. However, Hearthstone (a spinoff of dubious canonicity) shows a few Pandaren who serve the Old Gods, as well as an entire Pandarian Generic Ethnic Crime Gang, the Jade Lotus. The Toads and Yoshis are always helpful. The RPGs have introduced exceptions, though never quite to the same level of outright villainy as the Koopa Troop. The Star Sprites of Mario & Luigi are portrayed as benevolent angel-like protectors of the Mushroom Kingdom, even if Starlow, the only prominently featured member of their race, is portrayed as a bit of a Little Miss Snarker. Divine Dragons in Fire Emblem are always good. All other types of dragons have at least one villainous member in the series (Earth/Dark Dragons are outright Always Chaotic Evil), but the only two times a Divine Dragon is fought in the series outside of multiplayer were Tiki in Shadow Dragon, who was brainwashed, and Morva in Sacred Stones, who was a reanimated corpse. Shin Megami Tensei subverts this with their rendition of angels. Lawful? Certainly. Good? AHAHA no. This is deconstructed in, of all things, Touhou. The Celestials are explicitly stated to be Always Lawful Good, since that's the requirement to become a Celestial. However, the only Celestial to be named in the story, Hinanai Tenshi, is one hell of a rabble rouser because she finds herself unable to live up to this standard. If a race in The Legend of Zelda is made up of NPCs who you can talk to and who don't have danger music playing when you are near them, then they're automatically this. The only time they actually become hostile to Link is if they've been forcibly turned into monsters. The Legend of Zelda: Oracles of Ages officially determines them to be two subraces of Zoras. The (usually) evil, monstrous-looking Zoras that debuted in the first game are called River Zoras, while the more humanoid Zoras that debuted in Ocarina are called Ocean Zoras. Fairies are considered to be totally good in Spyro the Dragon by the older dragons, and there hasn't been anything to prove them wrong. Ōkami's Celestials, which are pretty much this game's version of angels, are implied to be this. In Dragon Age: Origins, the Cousland family, firm believers in noblesse oblige, are this to Ferelden. They govern the teyrnirnote A Duchy, more or less of Highever, and are ardently loyal to the Fereldan crown. Teyrn Loghain's claim that they were secretly Orlesian collaborators is met with suspicion and disbelief by much of the rest of the Fereldan nobility in the first game (and their suspicion is well-founded). The Dimension of Lame from Sluggy Freelance is filled with people like this. They consider littering and food fighting to be the most horrific crimes imaginable, not because All Crimes Are Equal, but because they can't imagine anything worse. The Devas, Archons and related Lawful Good entities in The Order of the Stick. They even point out that Lawful Stupid is the Stupidest Thing I've Ever Heard. Entities such as them exist in a state of grace that is literally impossible for mortals to reach, meaning they forgive and tolerate mistakes made by Lawful Good characters - even to the point of such characters embracing Chaos in the form of being The Snark Knight or even a Knight In Sour Armor - as long as they are consistently trying to be Lawful Good. Best part? This is a high quality Real Life Aesop - good people screw up. Doesn't mean we shouldn't stop trying to be as good as we can be. Roy's Deva: People forget how crucial it is to keep trying, even if they screw it up now and then. They figure that if they can't manage it perfectly every waking second, then they should just pick some other alignment because it'll be easier. But it's the struggle that matters. It's easy for a being of pure Law and Good to live up to these ideals, but you're a mortal. What matters is that when you blow it, you get back up on the horse and try again. Paladins are a weird case. On the one hand, they are based on the paladins of 3.5 Dungeons and Dragons, meaning they are supposed to be Lawful Good. On the other, the series is partially a satire on how people play D&D, meaning that many paladins, particularly in the prequel comics, are overbearing, sanctimonious murderhobos. In Axe Cop, all mermaids are good guys. Unfortunately they had mean and nice facial expression confused, so Axe Cop ended up killing one for looking evil before they cleared up the confusion. He usually does whatever he damn well likes, but this once he experienced My God, What Have I Done?. In Avatar: The Last Airbender and its Sequel Series The Legend of Korra, nearly all airbenders are Chaotic Good, favouring peace and freedom in equal parts. The exception is Tenzin (who is in fact Lawful Good); even Zaheer, the Big Bad of the 3 season, was motivated entirely by altruism and wanted for humanity to leave in freedom, though he was ruthless about his goals. Mormons in South Park, although this tends to make them incredibly annoying for everybody else. So much so that, since Heaven is full of Mormons, it's essentially worse than Hell for non-Mormons. Snarf's race in Thunder Cats are incapable of having evil in their hearts. This makes them immune to Mind Control and other snares without making them unwilling to fight. Dragons: Riders of Berk: "Animal House" establishes that all dragons have "protective instincts" for humans and especially their riders. Every 'evil' action committed by a dragon in the early series is either: a mother looking for its child, brought on by a toothache, or ignorance that their action was causing trouble. However, if dragons are tamed by evil people then they may do evil things.